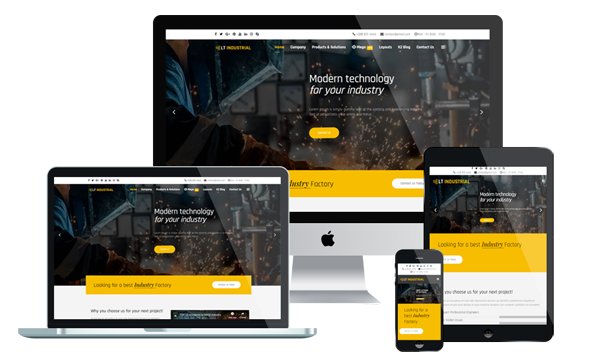 LT Industrial is Responsive Business WordPress theme. It is used for Engineering or Industrial websites to show your industrial talent and promote your quality products. Moreover, recruit the workers – provide job for those who have the capacity. For technique of Industrial WordPress theme, it builds from powerful framework with fully bootstrap supporting strong shortcodes, drag-drop layout content, Bootstrap CSS & Hybrid framework. This smart and eye-catching theme comes with 100% responsive layout that smoothly adapts to different screens (support tablets and all mobile devices), clean and stylish. In addition, LT Industrial comes with unlimited color to choose from and much more. Let customers know who you are, what your company offer through this page, and you can present your mission, vision and history to everybody. Besides, introduce the Innovations, Experience or Solutions of your company to the customers. This page presents different service packages that you can update for your company, so customers can choose the ones they want. It is simply to customize columns/rows and manage the pricing table from its built-in admin panel. A strong company needs an extremely effective team-work and through this site customers could figure out how your teams work in your company. In addition, customers could learn more about the needed information of each staff in your company. Write about news and trends in industry, share blog posts about your top products on social medias like Facebook, Twitter, Google+… This is the best way to improve your customers relationship via blog. Use this page to provide customers with your companys address, telephone number or email address. So with this built-in web form, customers can easily get in touch with you. Request more information about your services and give their feedback on using them.